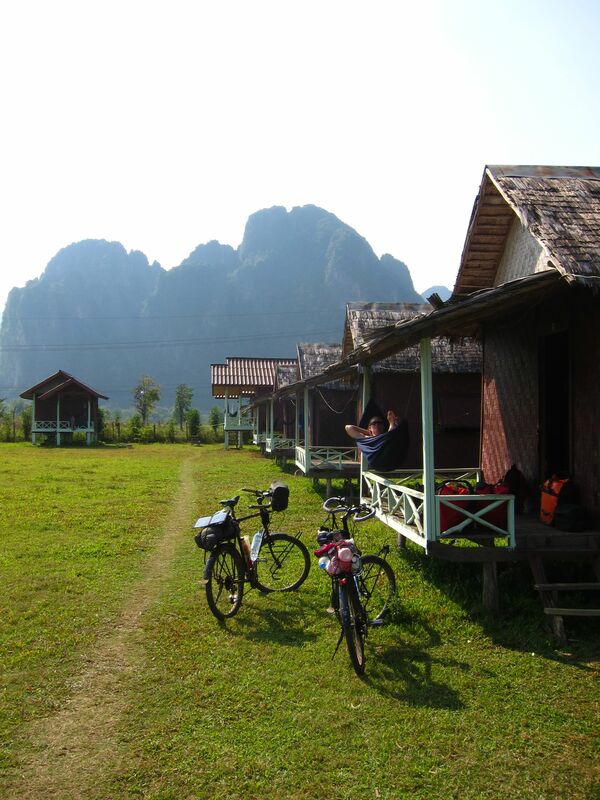 Vang Vieng turned out to be such a nice town, we opted to stick around for a second day to explore a little more. Our hotel didn’t turn out to be as great as expected. The wifi wasn’t available in our room and neither was breakfast. The bed was uncomfortable, so Chandler didn’t sleep well. After one more dip in the pool, we left to find something a little cheaper. 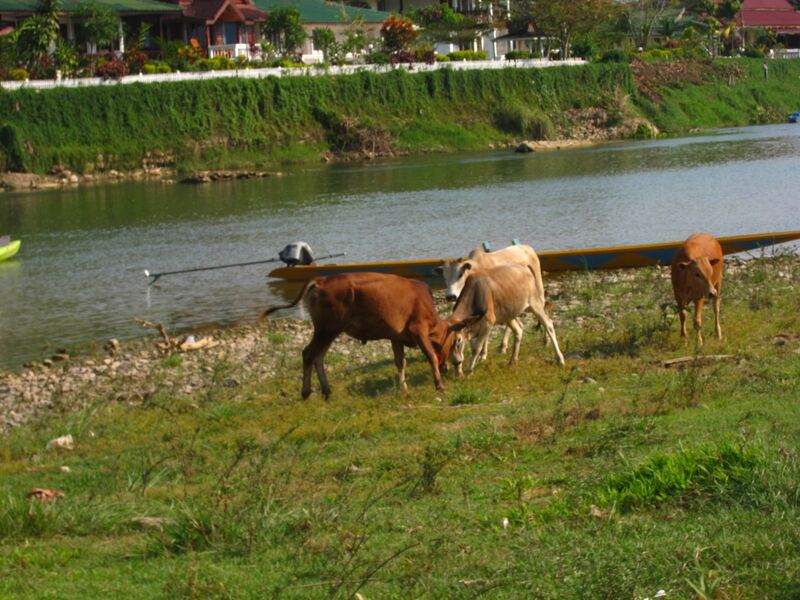 On our way to cross the river, to find some cheap bungalows, we ran into two Korean bike tourists. They invited us to a bonfire that night at the very bungalows we were going to. Looks like it was a good idea to leave the other hotel. After checking out the bungalows (30,000 kip/night less than $4), we dropped off our stuff and headed out to one of the many caves in the area. We traveled along a very bumpy dirt road for 7km before reaching the Tham Phu Kham cave and the “blue lagoon” which was actually kind of brown. We paid an entrance fee of 24,000 kip or $3 USD and had access to both attractions. The blue lagoon was a nice looking swimming hole with areas to jump from and rope swings. However, the scene was like a frat party, with a hoard of backpackers drinking and admiring themselves in their bikinis. Not something Chandler and I were interested in joining. 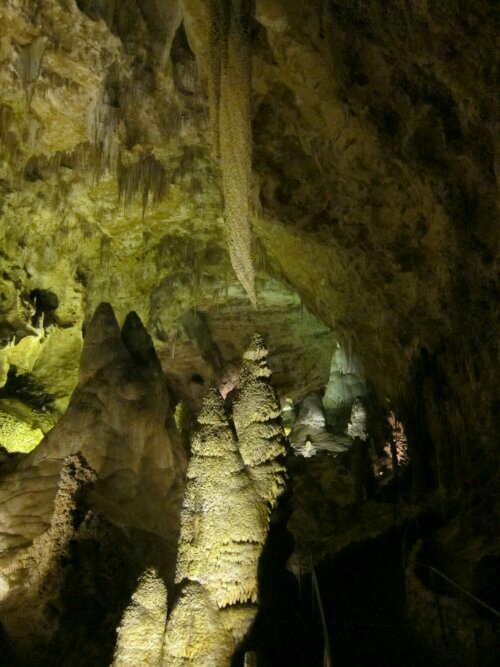 We headed to the cave instead. To reach the cave, there is a short, but very steep climb up the side of a mountain. The rocks were slippery but there were rickety bamboo poles to hold on to the whole way up. 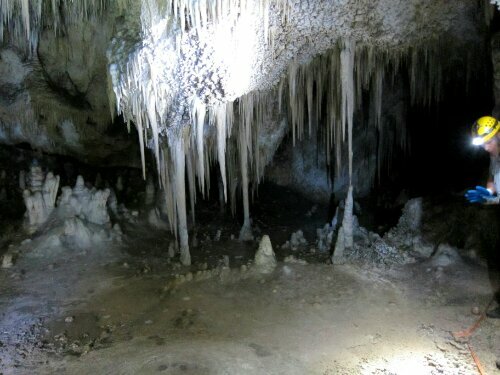 When we reached the cave, there was a cool breeze coming from the entrance, which was much appreciated. 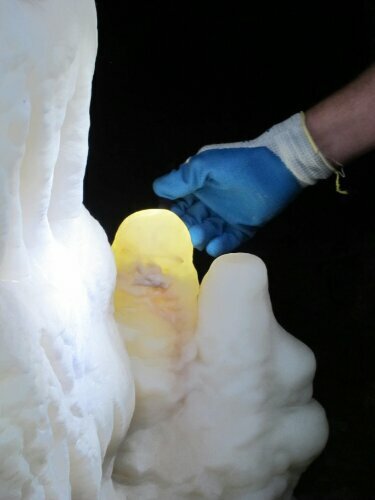 The cave starts out open and lit by sunlight coming in a couple openings. 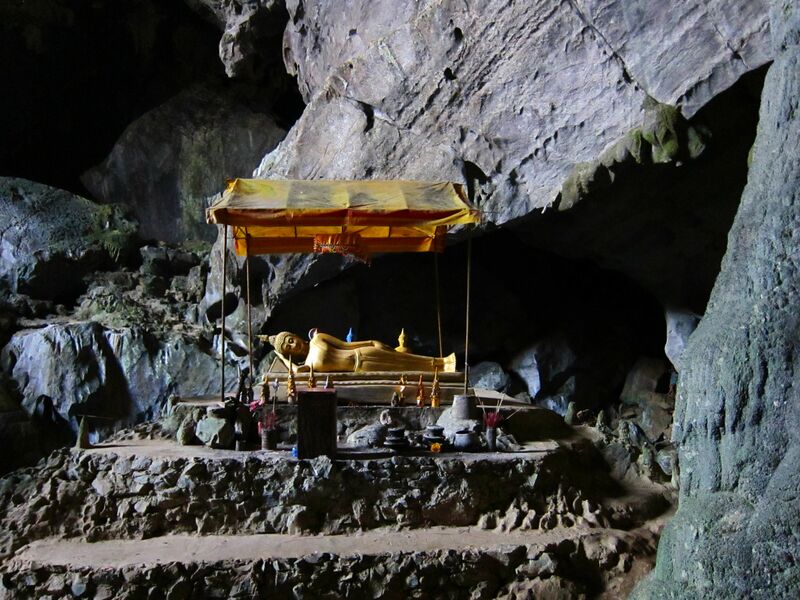 There is a scramble down past columns to an open chamber with a reclining Buddha. 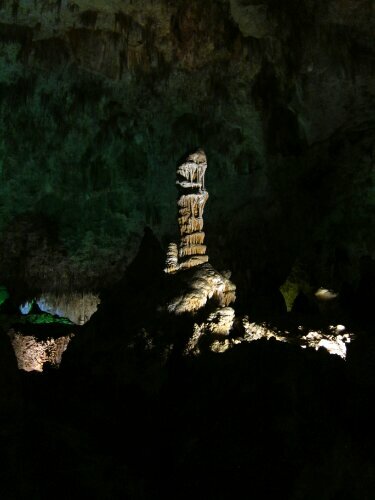 Besides the Buddha, this part of the cave was kind of boring with no interesting features. 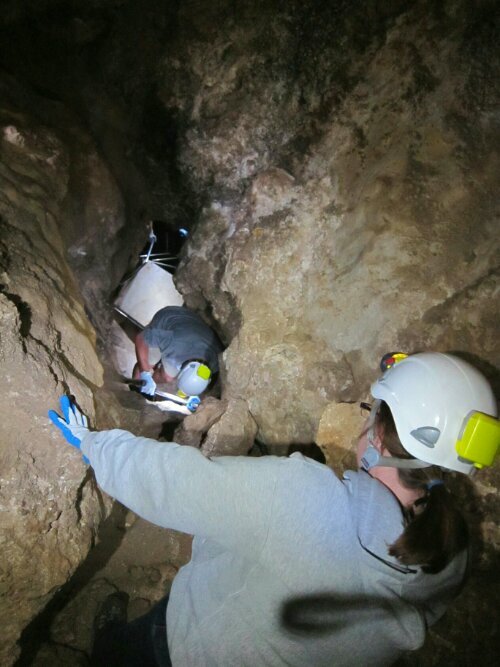 We brought our headlamps and decided to head to the real cave. 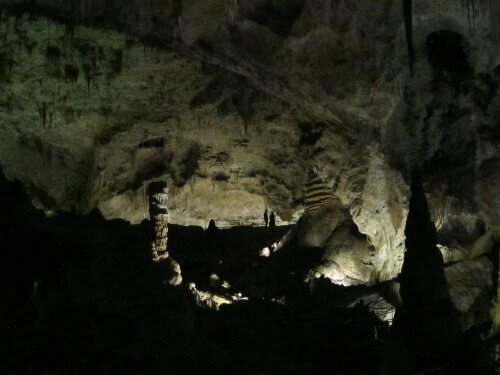 We had to climb over some big rocks through an opening and suddenly it was dark and we were reminded of when we went to Carlsbad Caverns. 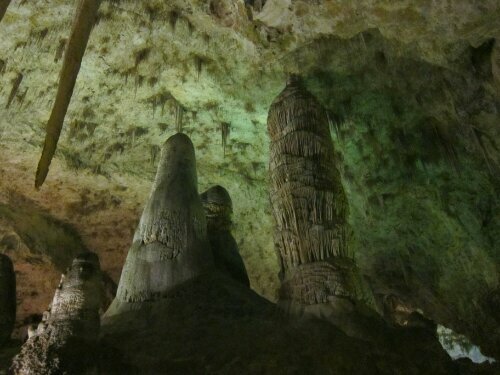 The cave was beautiful, full of stalactites, columns and stalagmites. 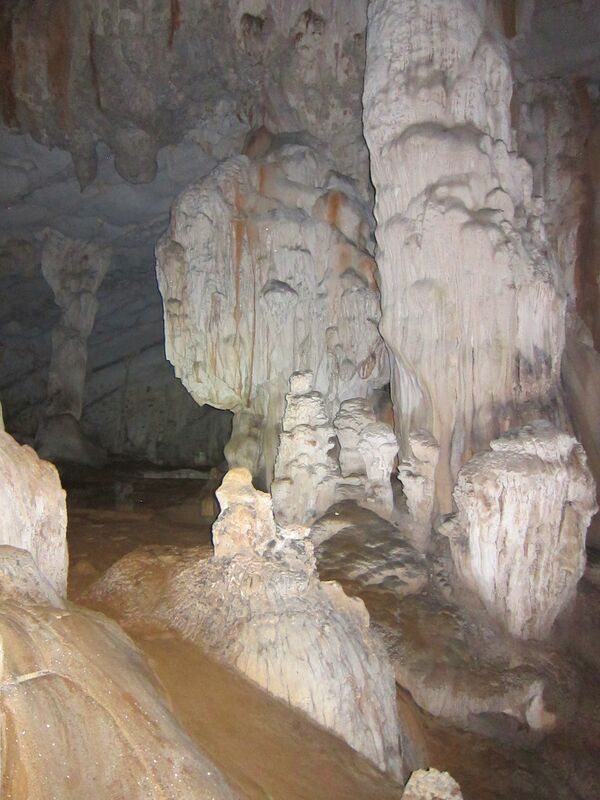 It was interesting to see the differences between a cave which had been preserved, Carlsbad and one that had not, Tham Phu Kham. We noticed where the rocks had been smoothed from so many people touching everything. 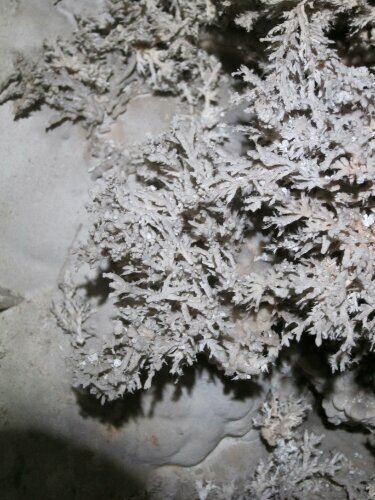 While some of the columns were sparkly and beautiful there were no really intricate or delicate crystal formations. 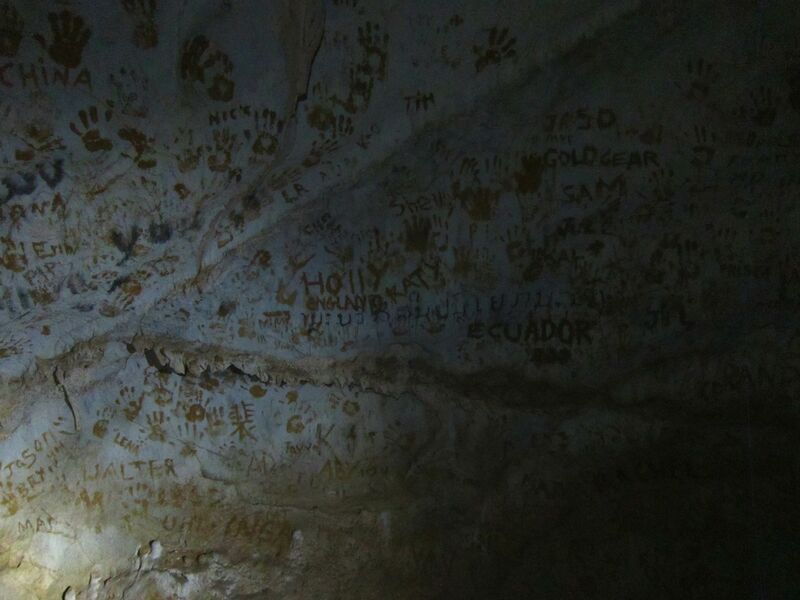 There was also quite a bit of graffiti, mostly in english, which we thought was sad that people would deface such beauty. We did turn off our headlamps to check if it was dark and it was pitch black. 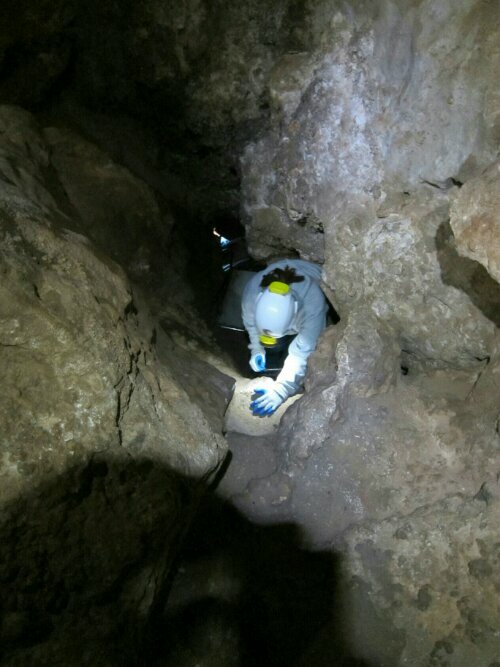 We were surprised to see bugs down in the cave where no light was penetrating. What do they eat? 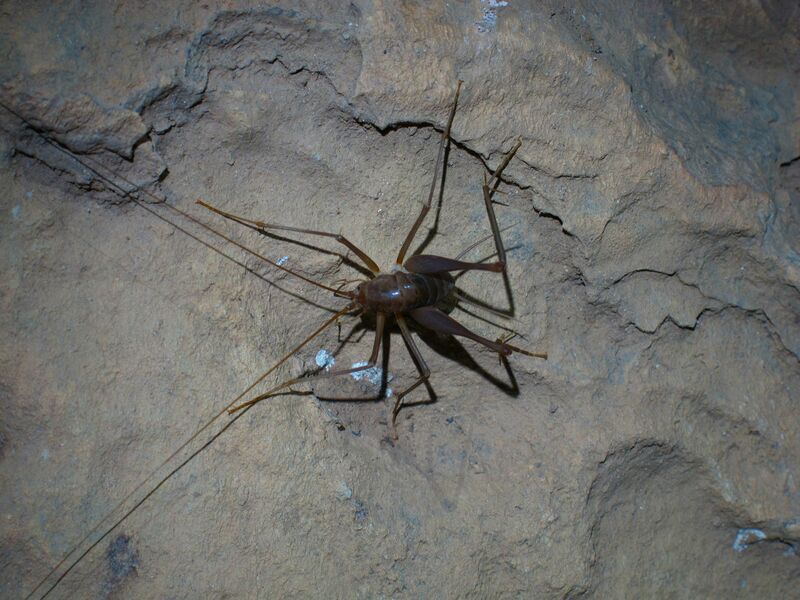 They were super creepy, like cricket spiders. There antennas were about 6 inches long, so we assumed they had grown to adapt to the darkness. By the time we exited the cave and climbed back down the hill, the sun was beginning to set. We made our way to our bikes through girls posing for photos in bikinis and guys throwing footballs. We rode back to town for a quiet evening around a fire. There were 6 Koreans including our cycle tourist friends and a Japanese couple. Everyone spoke some English, so we had good conversation and ate potatoes and corn they had cooked on the fire. We went to bed pretty early as we had plans to leave at 5:30 in the morning to beat the heat the next day.